The Gem Project, Inc. - We Captivate To Educate > Team Journal > Upcoming Events > 3-1-12 Mini Summit Event: Media Experts, Editors, & Published Writers Panel For Change with The Gem Project, Inc.
On March 1, 2012, The Gem Project will host their mini writers and media summit, as part of their networking benefit series. The series expects to garner young professionals who wish to network with those who are interested in but not limited to starting careers in writing and media. Panelists are contributors of magazines, award-winning bloggers, editors, free-lance writers, and social media strategists. Date : Thursday, March 1, 2012. Host: The Gem Project, Inc.
Price: $15, $10 with promo codes. Corynne L. Corbett is beauty director for ESSENCE, the nation’s premier lifestyle publication for African-American women. In this new role, Corbett is responsible for leading the beauty team and executing the overall beauty vision for the magazine-in addition to writing, assigning and editing articles. Corbett is a veteran journalist who uses her 20 years of experience in fashion, beauty and lifestyle to create engaging and compelling content across a variety of media platforms. Before joining ESSENCE, she served as executive editor of Real Simple magazine, where she oversaw the coverage of fashion, beauty and food for the magazine. Previously, she also served as its beauty/wellness director. Additionally, she served in the role of editor-in-chief at both Mode and Heart & Soul magazines. Prior to this, she spent 8 years in the beauty department for Elle. Early in her career she was also a regular contributor to ESSENCE for its beauty stories. Corbett is also the founder and Chief Executive Officer of Chic Jones Media LLC, a company that builds communication and community between women. 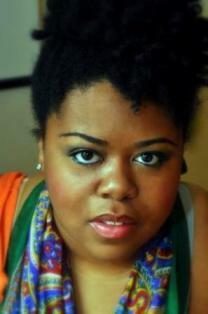 In May 2008 the company launched That Black Girl Site, which features Corbett’s own blog, That Black Girl Blogging. Corbett is a graduate of Pratt Institute. She is a member of the American Society of Magazine Editors and the National Association of Black Journalists. Slim Jackson, award-winning blogger of SBM. Ebony Magazine’s Power 100. Slim Jackson is the Executive Editor for Single Black Male (SBM), an award-winning relationship and lifestyle blog focusing on the black male perspective. SBM has been listed in Ebony Magazine’s Power 100 list, in addition to being mentioned in Essence Magazine and profiled on Clutch Magazine’s website. Outside of his efforts at SBM, Slim maintains a personal development blog atwww.therealslimjackson.com. He’s also been a guest on the Michael Baisden show and various online radio productions. You can find Slim writing for other online venues including Uptown Magazine. 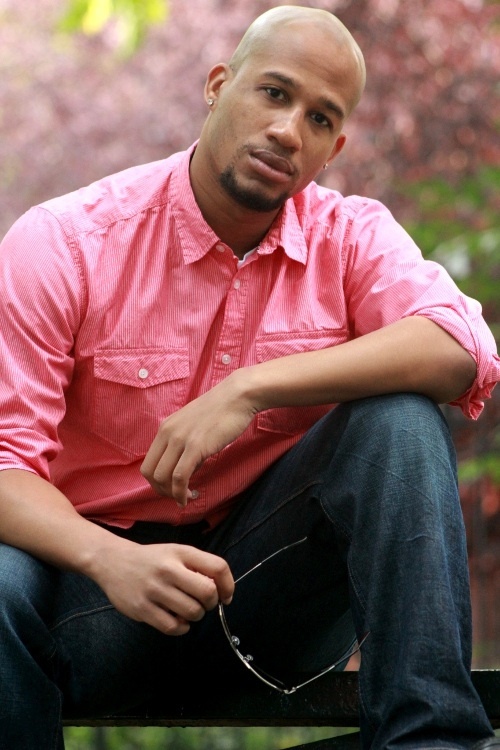 Slim resides in Harlem, where he maintains a day job as an HR professional for a global nonprofit. Chana Ginelle Ewing, Founder and Social Media Manager of Michelle O’ Brunch. Chana Ginelle Ewing is the Head Girl in Charge (HGiC) at and Founder of littlebigGirl + CO.
At littlebigGirl + CO. she provides strategic storytelling and community building consultation, social media marketing and experience production. As a trained filmmaker, Chana employs the tools of fiction storytelling to craft the story and world of her Clients and their communities. Story is her guide, though not her destination; Chana has designed a framework to connect story to community. In addition to working with Clients, she creates original content and communities. Meghan Reid is currently a content writer for WebiMax, a search engine optimization company that works to increase client web visibility. Reid is a talented writer with a keen eye for detail that has allowed her to excel in online media. She is a young professional continuously working to gain more experience and knowledge in different aspects of online media, such as social networking and blogging. Reid studied journalism and media studies at Rutgers University’s nationally recognized School of Communication and Information. In 2010 she received her B.A. in journalism and Africana studies. During her time at Rutgers she interned for MY9 TV News and NBC’s iVillage where she gained a wealth of knowledge in broadcasting and online media. She has studied abroad at the University of Ghana, Legon. Since then she has become a fashion and arts writer for Face2face Africa and freelance writer for publications, such as Fitness Magazine and Sister 2 Sister, covering a variety of topics. Her interests include print and online media about women’s lifestyle media, restoring Africa’s image, health and beauty. Ayesha K. Faines is a television journalist and free-lance writer based in New Jersey. She recently returned to the Northeast from Jacksonville, Florida where she worked as a television news reporter and anchor for several years at the number one station in the market. Ayesha began her professional journalism career in 2007, during her senior year at Yale University. Following a successful internship, CNBC Business News hired her to write financial news articles for their website, CNBC.COM. This included a series of articles leading up to the 2008 Presidential Election titled “Your Money, Your Vote”. Ayesha has contributed business news and political articles to various print and online publications. She is also the author of “Fly, Funky, Diva”, a culture blog, now in its fifth year, geared toward women of color, in their ‘twirties’. After working pre-emancipation hours in the South, Ayesha is back in her native New Jersey, happily taking some time off to exhale…. and to complete her first book, a non-fiction that chronicles Generation Y’s professional pursuits. Ayesha also enjoys writing love poetry and performing at local open mic venues whenever she gathers the nerve. panelists. 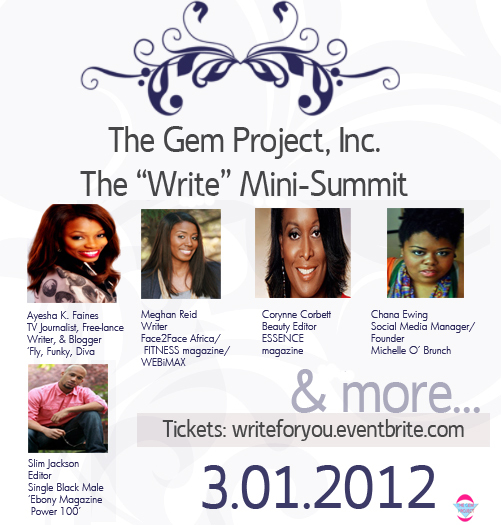 For a full list e-mail: project@thegemproject.orgWho is benefiting from this event? We are fundraising for three other organizations! We are happy to announce that we’ll have She’sTheFirst (http://shesthefirst.org) , FP Youthoutcry Foundation (http://fpyouthoutcry.org), and Miss Newark Pageant join the list of organizations, that will benefit from this event. About The Gem Project, Inc.- You may visit – http://thegemproject.org, for more information and program list.